I've always enjoyed operating on 30 Meters but lately it's been one of the more productive bands for QSO's here at the bottom of the solar cycle. If you haven't been on 30 Meters for a while or maybe you've never been there it's time to take a look. There's a moderately active Yahoo group for all things related to 30 Meters. You can look at the group web page where you'll find information on how to subscribe as well as a link to a great 30 Meter spot page. The spot page deserves special note. Besides the usual features there are also feeds that come from "auto spot" stations such as mine. The auto spot stations listen around 10.140 MHz and when they decode PSK31 streams they spot them without an operator manually typing in the information. If your CQ or QSO shows up as an "auto" it means the station at that location heard your signals well enough to decode it. This near real-time propagation indication can give you good information on where you're really being heard. Currently there are just two auto-spotting stations in the US but look for more around the world to show up soon. Lack of Sunspots Got You Down? Does the current lack of sunspots have you down? Don't forget to check out 30 meters! 30 meters continues to be a productive band both day and night even during the solar minimum. One group who promotes its use is the 30 Meter Digital group hosted on Yahoo. They use a variety of modes like PSK, RTTY and MFSK. Mostly they have a lot of fun and just encourage operators to remember 30 meters. One neat thing they also promote is a nicely done digital spots page done by Sholto, KE7HPV. Please join anytime but especially look around 10.140 MHz on Sunday and Thursday nights when activity is especially encouraged. There is no phone operation on 30 meters in the US but CW is alive and well there too. The QRP watering hole is 10.106 MHz but there's generally activity from 10.100 MHz to 10.130 MHz. Antennas are easy on 30 meters as well. A dipole is less than 50 ft long and chances are something you already have something up will work anyway. 30 meters is a shared allocation, remember to stay under 200 Watts. Remember... someone's got to call CQ! The band will sound dead if everybody just listens. Well, vacation was over all too quickly but we had a great time. What can you say about operating W1AW? I was only there for an hour or so but what a whoot! Conditions weren't fantastic but I made about 10 contacts. I highly recommend stopping by to operate if you're ever in the area. People seem to love to work the station and it was a lot of fun to call "CQ CQ DE W1AW." Another thing that impressed me about W1AW was the equipment. Yes, they have an amazing array of radios, amplifiers, etc. but it was the antennas that made me think. They are equipped to operate all sorts of HF, VHF, UHF but for the most part their antenna systems take up very little space. If you get to thinking your lot is too small to put up an antenna studying some photos of their towers may give you some good ideas. As for the rest of our trip it was fantastic. The Fall colors were in full swing in New Hampshire and Vermont. We planned to do a lot of goofing off and relaxing and my report is we were very successful. Where In The World Is Tim? The N9PUZ-10 TelPac gateway has been running very smoothly. There are several local users active with Winlink via the gateway now and it's been working well. I have some equipment changes I'd like to make just to switch to some dedicated equipment I've picked up but that will all wait until the weather turns bad for outdoor projects. It's no surprise to anyone that the higher frequency HF bands and even the lower bands to some extent are really bad. Few sunspots, etc. I've had some fun the last couple of months during the Adventure Radio Society "Spartan Sprints" but that has a lot more to do with it being QRP CW than it any sort of outstanding scores. The first part of October I'll be out in the New England area. I hope to visit and operate W1AW one day and do a little portable QRP operation from the White Mountains area of New Hampshire. No set schedule for anything, it is a vacation after all! Yesterday K9WAV, one of the local APRS iGate operators started gating my TelPac Gateway beacon into the Springfield area APRS network. The result is if you are traveling in the area a red Winlink icon will appear on the local APRS map with info about the frequency to use for emails, etc. Take a look at N9PUZ-10 here. Also, we've been up and running about 1 week now and are looking forward to Field Day Winlink contacts to and from the W9DUA club effort. Yeah, so the HF propagation stinks at this point in the solar cycle. Your group may not set any records but I hope everyone gets out to Field Day this year and invites along a bunch of those newly licensed Generals. Teach 'em about antennas. Play with some 6 meter stuff--there may just be an opening. Most of all welcome them into the world of HF and Amateur Radio! During the past few days there have been more tweaks and changes on the N9PUZ-10 TelPac Gateway. Things are pretty darn stable right now. The RF problems have gone away with the switch from the FT-1500 back to the IC-207H. I'm sure I'll be able to use the FT-1500 but I need to work on a better grounding setup and I have other fish to fry right now. Several users from the WL2KEmcomm group on Yahoo sent me copies of their KAM Plus TNC ".aps" files to initialize and control the TNC. There were a few tweaks in those that have brought my gateway to a stable condition. It's been running for several days without a glitch now and file transfers, updates to the APRS servers, etc. all appear to be working properly. If you're in the Springfield, Illinois area and have VHF packet radio capability check out my TelPac Gateway web page and give it a try. What are the future plans? Well, right now I'm building a TNC-X kit with the USB option so that I can have a portable station to do more testing. The TNC-X looks interesting because it can use a USB connection to your PC. Important since serial ports are going out of style these days. Other users have reported good success with them and at under $100 with the USB option they're priced right. Other interesting features include a) an expansion connector so you can add other gadgets and b) you get the source code for the microcontroller! Well, all sorts of fun things since my last entry. The gateway is still running and several local users have been successful at using it to receive and send electronic mail via VHF Packet. Thanks to KC9GQR, K9WAV, and N9ZGE for their testing efforts! The past few days I experienced some quirky behavior with the system. Users got checksum errors when transferring email, occasionally got disconnected, etc. A user on the Yahoo Winlink group suggested it was similar to a problem he had that he tracked down to RF getting into the TNC. Earlier in the week I had removed the original radio (Icom IC-207H) from the gateway and replaced it with a Yaesu FT-1500. That was about the time the problems began. Last night I went back to the original radio and will be getting some items to address the RF issues with the Yaesu as I'd rather dedicate that radio to the project. I've been active in ARES work for quite some time with a special interest in digital communications. The evening of June 4, 2007 I put a VHF Telpac gateway into the Winlink 2000 system on the air in Springfield, IL. This gateway allows users with a VHF FM radio, a TNC, and some free software to send and receive email via VHF packet radio in our area. More details are on my main web site. My personal thanks to all those who have served and still serve in our Military. All have given up a lot for our freedom by being away from their own families, suffering permanent injury, and enduring horrible conditions around the globe. Many have paid the ultimate price and today we especially remember and honor those men and women. Regardless of your own feelings about the current conflicts please never stop supporting the troops themselves. Rant and rave to our elected officials about whether or not we should be involved. Always, always keep our troops in your hearts and prayers. Support them and their families. N8S is up and running from Swains Island! Cool stuff, hope I can work them before they QRT. Last night and today I've been watching the DX clusters to see who's working them, what bands, what modes, etc. As usual the morons with all of the "crap" spots have swung into action for the occasion. Why would anyone possibly think the rest of us would be interested in knowing that a) they can't hear them, b) they aren't operating their favorite band/mode, etc.? Imagine how busy the cluster would be if every Ham on the planet who didn't hear N8S posted a message to that effect. Now wouldn't that be special? Here's hoping considerate DX'ers will use the clusters appropriately. If you're the first one in your area to work them on 40 CW today please spot 'em and tell us the frequency. If there's already 3 or 4 recent spots from your area but you weren't able to get a contact we're all sorry but we really don't care to know about your lack of luck via a post to the DX Cluster. Go grumble to your friends or cry in your beer. ...is the most frequent question asked by someone studying for their Technician license or just having passed the test and waiting for their call sign to appear. Very often they have been attracted by the siren's song of a multi-band handheld, what we used to call a handie-talkie. My advice before you purchase anything is to investigate your specific needs and location before you pull out that wad of cash. A hand held radio may be just the thing or it could be fairly useless. Let's think about your locale first. Are there a lot of repeaters in your area? What kind of coverage do they have? If there are very few local repeaters or they do not have good coverage a hand held radio may not do you much good no matter how cool it looks. If it turns out that most of the hams in your area operate simplex without using a repeater you may want a more powerful mobile type radio along with an external antenna. Also consider what type of activity there is in your area. Does everyone use 2 Meters? Is there any activity on 440 MHz? Whether you buy a hand held or a mobile type radio you can often save a lot of money if you need only 2 meter FM capability. Note if you go the mobile radio route you will need some sort of a power supply, an external antenna, and some coax to use it in the house. The best advice is to seek out and talk with local Hams. They will know what's used in the area where you live. Despite what the advertisements may claim not every mode and band is popular in every part of the country. Track down the local radio club, ARES, or Skywarn group. These folks will know what type of radio works best in your area. Welcome to all of the new General (and Extra) class licensees that have appeared on the HF bands since February 23rd when the Morse proficiency requirement officially went away. It's good to hear so many new operators who by and large are doing a great job. I hope we also hear a lot of Technician and General OPs in the CW portions of the ham bands. With the testing requirement gone you can learn and experiment with CW at a more relaxed pace. Heck, even if you still need a cheat sheet for some of the characters give it a try even if your first efforts are at just a few words a minute. Even if you're not a great CW operator--I'm certainly not compared to many others--it's a lot of fun and can net you some contacts that are unobtainable otherwise. Several times in the past few weeks I've heard discussions regarding what is required for legal station identification by US Amateur Radio operators. I always thought that I knew the legal requirement and I'll bet most other Hams believe they know as well. But there seem to be a variety of opinions including a common belief that you must identify your own station as well as the station with which you are in contact every 10 minutes. (a) Each amateur station, except a space station or telecommand station, must transmit its assigned call sign on its transmitting channel at the end of each communication, and at least every ten minutes during a communication, for the purpose of clearly making the source of the transmissions from the station known to those receiving the transmissions. No station may transmit unidentified communications or signals, or transmit as the station call sign, any call sign not authorized to the station. Note that in the preceding and in fact in the entirety of 97.119 that there is no mention of any requirement to identify the station with whom you are in QSO with. You are only responsible for identifying your own station once every 10 minutes and at the end of the communication. Now it is very common in CW and other digital modes to hear people identify both stations at the beginning and end of every transmission. Legally this doesn't appear to be necessary however as a matter of good operating procedure it seems that it would be common courtesy to mention the other station specifically frequently since non voice modes can easily all "sound" the same. This allows both operators to stay in the same conversation and not inadvertently wander off. I was always taught to use both call signs once in every CW transmission and both call signs for the once every 10 minute requirement on phone. What do you think is good procedure? 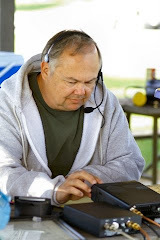 These days when you read the posts on QRZ.com or your favorite email list there's a lot of talk about the declining quality of the people coming into ham radio. I'm not sure that I agree that's true. After all, there have been lids as long as I can remember. If it is true perhaps those of us who've been around a while should shoulder some of the blame. A lot of us devote time each year to helping out with Techician classes, etc. at the local club. This is a good thing but don't let it stop there. I think a lot of times a new Techician earns his or her ticket and that's practically the last time they ever hear from a Ham in their area. Once they have a license the real teaching needs to begin if we want to create good operators instead of just statistics. In the Fall of 2006 my local club, the Sangamon Valley Radio Club and the nearby Macoupin County Amateur Radio Club co-sponsored a Technician class that produced around 20 new Hams. We didn't let the teaching and the fun end at the VE exam session. Shortly after the class ended several club members had new Hams over to their shacks so see equipment in operation and to let the new folks be guest operators to check into the local VHF nets, etc. This sort of activity provides an introduction to the local community and gets the new people interacting on a more personal level. Shortly after the new year, we held a "no host" Technician Class Reunion at a local restaraunt that featured a buffet style breakfast. We invited all of the people from the class plus spent a couple of weeks making sure as many area hams as possible knew about the event. The result was a 50/50 mix of old hands and newcommers that spent the morning talking, eating, and making new friends. As we adjourned from breakfast there was even a mobile antenna installation going on in the parking lot! So, by all means keep teaching those Technician, General, and Extra courses. Just don't forget to keep Elmering!